Prof. Gershon Galil of the University of Haifa who deciphered the inscription: "It indicates that the Kingdom of Israel already existed in the 10th century BCE and that at least some of the biblical texts were written hundreds of years before the dates presented in current research." A breakthrough in the research of the Hebrew scriptures has shed new light on the period in which the Bible was written. Prof. Gershon Galil of the Department of Biblical Studies at the University of Haifa has deciphered an inscription dating from the 10th century BCE (the period of King David's reign), and has shown that this is a Hebrew inscription. The discovery makes this the earliest known Hebrew writing. The significance of this breakthrough relates to the fact that at least some of the biblical scriptures were composed hundreds of years before the dates presented today in research and that the Kingdom of Israel already existed at that time. 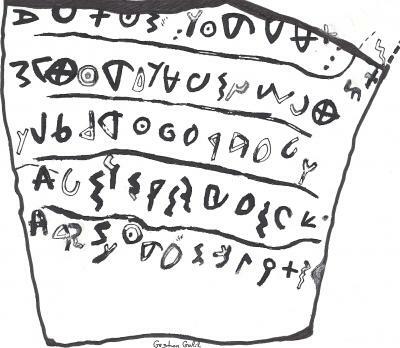 The inscription itself, which was written in ink on a 15 cm X 16.5 cm trapezoid pottery shard, was discovered a year and a half ago at excavations that were carried out by Prof. Yosef Garfinkel at Khirbet Qeiyafa near the Elah valley. The inscription was dated back to the 10th century BCE, which was the period of King David's reign, but the question of the language used in this inscription remained unanswered, making it impossible to prove whether it was in fact Hebrew or another local language. Prof. Galil's deciphering of the ancient writing testifies to its being Hebrew, based on the use of verbs particular to the Hebrew language, and content specific to Hebrew culture and not adopted by any other cultures in the region. "This text is a social statement, relating to slaves, widows and orphans. It uses verbs that were characteristic of Hebrew, such as asah ("did") and avad ("worked"), which were rarely used in other regional languages. Particular words that appear in the text, such as almanah ("widow") are specific to Hebrew and are written differently in other local languages. The content itself was also unfamiliar to all the cultures in the region besides the Hebrew society: The present inscription provides social elements similar to those found in the biblical prophecies and very different from prophecies written by other cultures postulating glorification of the gods and taking care of their physical needs," Prof. Galil explains. He adds that once this deciphering is received, the inscription will become the earliest Hebrew inscription to be found, testifying to Hebrew writing abilities as early as the 10th century BCE. This stands opposed to the dating of the composition of the Bible in current research, which would not have recognized the possibility that the Bible or parts of it could have been written during this ancient period. Prof. Galil also notes that the inscription was discovered in a provincial town in Judea. He explains that if there were scribes in the periphery, it can be assumed that those inhabiting the central region and Jerusalem were even more proficient writers. "It can now be maintained that it was highly reasonable that during the 10th century BCE, during the reign of King David, there were scribes in Israel who were able to write literary texts and complex historiographies such as the books of Judges and Samuel." He adds that the complexity of the text discovered in Khirbet Qeiyafa, along with the impressive fortifications revealed at the site, refute the claims denying the existence of the Kingdom of Israel at that time. The contents of the text express social sensitivity to the fragile position of weaker members of society. The inscription testifies to the presence of strangers within the Israeli society as far back as this ancient period, and calls to provide support for these strangers. It appeals to care for the widows and orphans and that the king – who at that time had the responsibility of curbing social inequality - be involved. This inscription is similar in its content to biblical scriptures (Isaiah 1:17, Psalms 72:3, Exodus 23:3, and others), but it is clear that it is not copied from any biblical text.